I think everyone who has cats that regularly use an indoor litter tray has had to suffer with litter tracking. That is, when your kitty jumps out of their litter box and carries litter throughout your home. Even though my litter box is in a bathroom I still find litter in my lounge or bedroom. 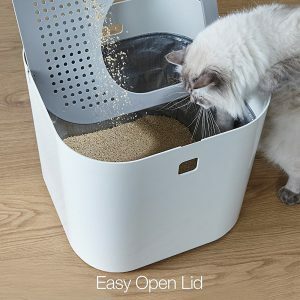 This top entry litter box from Modkat though is designed to help cut down litter tracking. The Modkat is a very stylish and very modern looking litter box. Those open plastic trays of the past have now been overtaken with new stylish designs. These should fit into a modern home and not look out of place. In order to reduce litter tracking Modkat have come up with an innovative design which allows “rooftop access” into the litter. In other words this is a top entry cat litter box which your cat enters via a hole in the litter box roof. The litter box roof is actually a locking lid. This lid is also textured to clean the litter from your cat’s paws before they jump down onto your floors. Whilst it also has a seamless base which prevents leaks. Not only that but this has a stylish simplistic modern design. No longer do you have to find somewhere to hide the litter box. This litter box is also very useful if you have dogs in your house. Sometimes dogs do like to eat cat litter and other matter but this box stops them getting their head into the actual litter area. 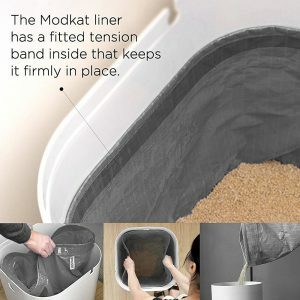 The Modkat is an all in one solution to litter box needs. 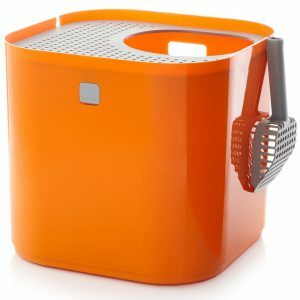 It has its own scoop which is designed to hang anywhere on the side of the box so you do not mislay your scoop. And you get a reusable tarp liner. The tarp included with the Modkat is made from commercial strength tarpaulin. It is resistant to ripping and is simple to clean. The tarp is then secured inside the box by a tension band and can be lifted out for easy litter changes. The liners last up to 3 months depending on usage. So if you have multiple cats using the box or cats that like to madly dig in the litter then you may need to change the liner more often. I really like the modern design of this litter box as it does not look like a cat toilet. I like the thought that has gone into reducing litter tracking and keeping other household pets away from the litter and any deposits itself. Top entry litter boxes are a great alternative to your standard litter box and helps to hide your litter tray. It is also really easy to clean as the lid just swivels out of the way and doing a full litter change just means lifting the tarp liner and then throwing the contents in the trash. Kittens will find it very easy to get inside this litter box as well. My only concern might be for an elderly more arthritic cat who might not be able to negotiate the top down entry. The price is also higher than your basic tray shaped cat litter box. If you want to add a Modkat cat litter box to your home, have a look at the color range on Amazon. I never knew that there was such a thing as a stylish litter box! I love the way it looks and I’m considering buying this for my 16 year old kitty named Star. The only concern is that it looks like the cat needs to be able to jump to the top in order to enter it. Although she’s healthy now and acts like a much younger cat. I’m worried that she may be unable to get inside of it at some point soon. What you you think about buying one for a cat as old as mine? Litter box design has improved over the years. Mainly because I think a lot more people are now keeping their cats indoors more often. With regards to your older kitty (aww Star is a cute name), this box is only 15 inches high and has a flat “roof” on it so your cat does not need to jump direct into the box. I often thought this was going to be a problem with my old 19 year old cat getting into her litter robot. I placed a step under the litter box for her to step on to climb in – great in theory but she completely ignored it and jumped over it! The manufacturer does also offer a 30 day money back guarantee if your kitty does not like the box. 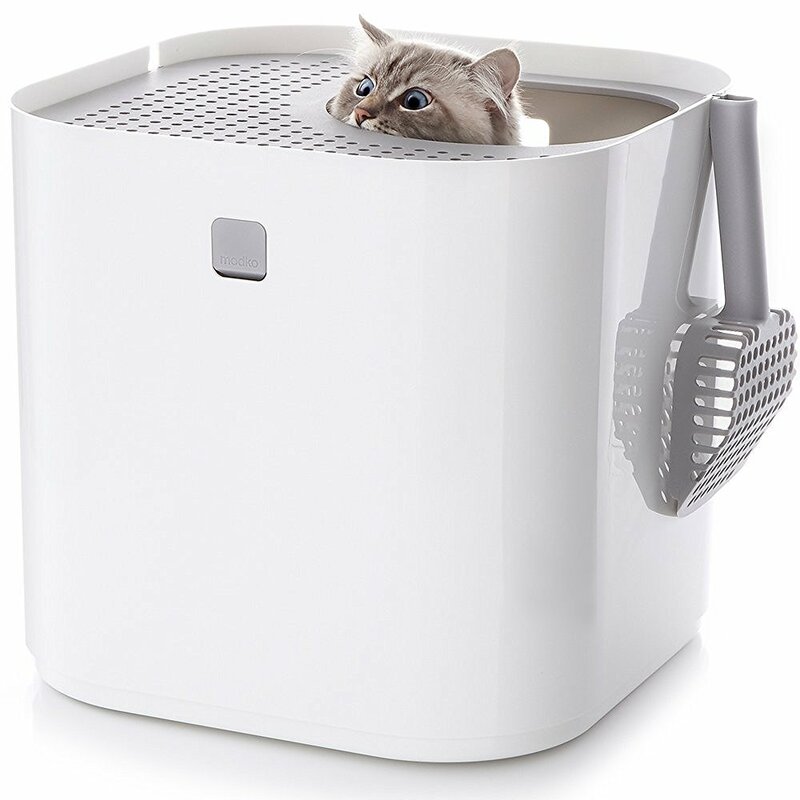 I really like the look of this cat litter box. It looks stylish and will go nicely in a small apartment. I have to change the liners every three months – How much do the liners cost? Is there any specific cat litter I must buy for this litter box? Hullo Celeste. The average time of changing the liner is about 3 months – usually when it starts fraying. Some customers have said that they change the liner much less frequently than 3 months. Liners come in packs of three – so you can wash one out and fit another, have a look at the link for best pricing. You can use any litter but I would suggest a clumping cat litter which is easier to scoop.